 Please read the related post “Legal lessons from the Maguindanao massacre (02): bail” where I discussed the practical aspects of bail like motion to reduce bail, pictures, seeking the help of bail bondsmen or “pyansador,” what to do if someone borrows money from you to pay for bail, etc. The authorities —police, NBI, etc.— have ten days from issuance of the warrant within which to arrest the accused. If no arrest is made within that period of time, the reason must be stated in a report ("return") to the judge.The court may then issue an alias warrant that is valid until recalled. Hearing is summary in nature; the prosecution must show that the evidence of guilt is strong. The accused may submit affidavits of witnesses. The prosecution may (1) examine its witnesses on direct or (2) adopt the affidavits they executed during the preliminary investigation as their direct testimonies. The court must examine the witnesses on their direct testimonies or affidavits to ascertain if the evidence of guilt of the accused is strong. The court’s questions need not follow any particular order and may shift from one witness to another. The court must then allow counsels from both sides to examine the witnesses as well. The court must hear afterwards the oral arguments of the parties. Within 48 hours after the hearing, the court must issue an order containing a brief summary of the evidence presented before it, followed by its conclusion of whether or not the evidence of guilt is strong. This conclusion must not be regarded as a pre-judgment on the merits of the case, which will be determined only after a full-blown trial. Officers of the law arresting someone by virtue of a warrant need not have the warrant with them when making the arrest. If the private complainant executes an affidavit of desistance before the arraignment, the public prosecutor files a motion to withdraw the information. The court recalls the warrant or orders the release of the accused. A “buybust” operation is an entrapment procedure conducted by the police against drug pushers, who can be arrested on the spot and then searched, even without a warrant. If the recommended bail is too high, the accused may file a “Motion To Reduce Bail.” If granted, the court requires, however, the posting of cash bail. If the accused does not have a lawyer, he can file the motion by himself. He can ask around the Hall of Justice for anyone who knows the format of the motion and who can help him file it. Please read the history of the Miranda warning or the Miranda rights. The legality of an arrest can be questioned if the police did not observe the Miranda rights of an accused. These right are enshrined in our 1987 Constitution. Section 1. Definition of arrest. – Arrest is the taking of a person into custody in order that he may be bound to answer for the commission of an offense. Sec. 2. Arrest; how made. – An arrest is made by an actual restraint of a person to be arrested, or by his submission to the custody of the person making the arrest. No violence or unnecessary force shall be used in making an arrest. The person arrested shall not be subject to a greater restraint than is necessary for his detention. Sec. 3. Duty of arresting officer. – It shall be the duty of the officer executing the warrant to arrest the accused and deliver him to the nearest police station or jail without unnecessary delay. Sec. 4. Execution of warrant. – The head of the office to whom the warrant of arrest was delivered for execution shall cause the warrant to be executed within ten (10) days from its receipt. Within ten (10) days after the expiration of the period, the officer to whom it was assigned for execution shall make a report to the judge who issued the warrant. In case of his failure to execute the warrant, he shall state the reason therefore. Sec. 6. Time of making arrest. – An arrest may be made on any day and at any time of the day or night. Sec. 7. Method of arrest by officer by virtue of warrant. – When making an arrest by virtue of a warrant, the officer shall inform the person to be arrested of the cause of the arrest and the fact that a warrant has been issued for his arrest, except when he flees or forcibly resists before the officer has opportunity to so inform him, or when the giving of such information will imperil the arrest. The officer need not have the warrant in his possession at the time of the arrest but after the arrest, if the person arrested so requires, the warrant shall be shown to him as soon as practicable. Sec. 8. Method of arrest by officer without warrant. – When making an arrest without a warrant, the officer shall inform the person to be arrested of his authority and the cause of the arrest, unless the latter is either engaged in the commission of an offense, is pursued immediately after its commission, has escaped, flees, or forcibly resists before the officer has opportunity to so inform him, or when the giving of such information will imperil the arrest. Sec. 9. Method of arrest by private person. – When making an arrest, a private person shall inform the person to be arrested of the intention to arrest him and the case of the arrest, unless the latter is either engaged in the commission of an offense, is pursued immediately after its commission, or has escaped, flees, or forcibly resists before the person making the arrest has opportunity to so inform him, or when the giving of such information will imperil the arrest. Sec. 10. Officer may summon assistance. – An officer making a lawful arrest may orally summon as many persons as he deems necessary to assist him in effecting the arrest. Every person so summoned by an officer shall assist him in effecting the arrest when he can render such assistance without detriment to himself. Sec. 11. Right of officer to break into building or enclosure. – An officer, in order to make an arrest either by virtue of a warrant, or without a warrant as provided in section 5, may break into any building or enclosure where the person to be arrested is or is reasonably believed to be, if he is refused admittance thereto, after announcing his authority and purpose. Sec. 12. Right to break out from building or enclosure. – Whenever an officer has entered the building or enclosure in accordance with the preceding section, he may break out therefrom when necessary to liberate himself. Sec. 13. Arrest after escape or rescue. – If a person lawfully arrested escapes or is rescued, any person may immediately pursue or retake him without a warrant at any time and in any place within the Philippines. Sec. 14. Right of attorney or relative to visit person arrested. – Any member of the Philippine Bar shall, at the request of the person arrested or of another acting in his behalf, have the right to visit and confer privately with such person in the jail or any other place of custody at any hour of the day or night. Subject to reasonable regulations, a relative of the person arrested can also exercise the same right. Bail (Rule 114, The Revised Rules of Criminal Procedure)Section 1. Bail defined. – Bail is the security given for the release of a person in custody of the law, furnished by him or a bondsman, to guarantee his appearance before any court as required under the conditions hereinafter specified. Bail may be given in the form of corporate surety, property bond, cash deposit, or recognizance. The original papers shall state the full name and address of the accused, the amount of the undertaking and the conditions required by this section. Photographs (passport size) taken within the last six (6) months showing the face, left and right profiles of the accused must be attached to the bail. Sec. 3. No release or transfer except on court order or bail. – No person under detention by legal process shall be released or transferred except upon order of the court or when he is admitted to bail. Sec. 4. Bail, a matter of right; exception. – All persons in custody shall be admitted to bail as a matter of right, with sufficient sureties, or released on recognizance as prescribed by law or this Rule (a) before or after conviction by the Metropolitan Trial Court, Municipal Trial Court, Municipal Trial Court in Cities, or Municipal Circuit Trial Court, and (b) before conviction by the Regional Trial court of an offense not punishable by death, reclusion perpetua, or life imprisonment. Sec. 5. Bail, when discretionary. – Upon conviction by the Regional Trial Court of an offense not punishable by death, reclusion perpetua, or life imprisonment, admission to bail is discretionary. The application for bail may be filed and acted upon by the trial court despite the filing of a notice of appeal, provided it has not transmitted the original record to the appellate court. However, if the decision of the trial court conviction the accused ged the nature of the offense from non-bailable to bailable, the application for bail can only be filed with and resolved by the appellate court. Should the court grant the application, the accused may be allowed to continue on provisional liberty during the pendency of the appeal under the same bail subject to the consent of the bondsman. (e) That there is undue risk that he may commit another crime during the pendency of the appeal. The appellate court may, motu proprio or on motion of any party, review the resolution of the Regional Trial Court after notice to the adverse party in either case. Sec. 7. Capital offense or an offense punishable by reclusion perpetua or life imprisonment, not bailable. – No person charged with a capital offense, or an offense punishable by reclusion perpetua or life imprisonment, shall be admitted to bail when evidence of guilt is strong, regardless of the state of the criminal prosecution. Sec. 8. Burden of proof in bail application. – At the hearing of an application for bail filed by a person who is in custody for the commission of an offense punishable by death, reclusion perpetua, or life imprisonment, the prosecution has the burden of showing that evidence of guilt is strong. The evidence presented during the bail hearing shall be considered automatically reproduced at the trial but, upon motion of either party, the court may recall any witness for additional examination unless the latter is dead, outside the Philippines, or otherwise unable to testify. (j) Pendency of other cases where the accused is on bail. Sec. 10. Corporate surety. – Any domestic or foreign corporation, licensed as a surety in accordance with law and currently authorized to act as such, may provide bail by a bond subscribed jointly by the accused and an officer of the corporation duly authorized by its board of directors. Sec. 11. Property bond, how posted. – A property bond is an undertaking constituted as lien on the real property given as security for the amount of the bail. Within ten (10) days after the approval of the bond, the accused shall cause the annotation of the lien on the certificate of title on file with the Registry of Deeds if the land is registered, or if unregistered, in the Registration Book on the space provided therefore, in the Registry of Deeds for the province or city where the land lies, and on the corresponding tax declaration in the office of the provincial, city and municipal assessor concerned. Within the same period, the accused shall submit to the court his compliance and his failure to do so shall be sufficient cause for the cancellation of the property bond and his re-arrest and detention. (c) If there are two or more sureties, each may justify in an amount less than that expressed in the undertaking but the aggregate of the justified sums must be equivalent to the whole amount of the bail demanded. In all cases, every surety must be worth the amount specified in his own undertaking over and above all just debts, obligations and properties exempt from execution. Sec. 13. Justification of sureties. – Every surety shall justify by affidavit taken before the judge that he possesses the qualification prescribed in the preceding section. He shall describe the property given as security, stating the nature of his title, its encumbrances, the number and amount of other bails entered into by him and still undischarged, and his other liabilities. The court may examine the sureties upon oath concerning their sufficiency in such manner as it may deem proper. No bail shall be approved unless the surety is qualified. Sec. 14. Deposit of cash as bail. – The accused or any person acting in his behalf may deposit in cash with the nearest collector of internal revenue or provincial, city, or municipal treasurer the amount of bail fixed by the court, or recommended by the prosecutor who investigated or filed the case. Upon submission of a proper certificate of deposit and a written undertaking showing compliance with the requirements of section 2 of this Rule, the accused shall be discharged from custody. The money deposited shall be considered as bail and applied to the payment of fine and costs while the excess, if any, shall be returned to the accused or to whoever made the deposit. Sec. 15. Recognizance. – Whenever allowed by law or these Rules, the court may release a person in custody on his own recognizance or that of a responsible person. Sec. 16. Bail, when not required; reduced bail or recognizance. – No bail shall be required when the law or these Rules so provide. When a person has been in custody for a period equal to or more than the possible maximum imprisonment prescribed for the offense charged, he shall be released immediately, without prejudice to the continuation of the trial or the proceedings on appeal. If the maximum penalty to which the accused may be sentenced is destierro, he shall be released after thirty (30) days of preventive imprisonment. A person in custody for a period equal to or more than the minimum of the principal penalty prescribed for the offense charged, without application of the Indeterminate Sentence Law or any modifying circumstance, shall be released on a reduced bail or on his own recognizance, at the discretion of the court. Sec. 17. Bail, where filed. – (a) Bail in the amount fixed may be filed with the court where the case is pending, or in the absence or unavailability of the judge thereof, with any regional trial judge, metropolitan trial judge, municipal trial judge, or municipal circuit trial judge in the province, city or municipality. If the accused is arrested in a province, city, or municipality other than where the case is pending, bail may also be filed with any regional trial court of said place, of if no judge thereof is available, with any metropolitan trial judge, municipal trial judge, or municipal circuit trial judge therein. (b) Where the grant of bail is a matter of discretion, or the accused seeks to be released on recognizance, the application may only be filed in the court where the case is pending, whether on preliminary investigation, trial, or appeal. Any person in custody who is not yet charged in court may apply for bail with any court in the province, city, or municipality where he is held. Sec. 18. Notice of application to prosecutor. – In the application for bail under section 8 of this Rule, the court must give reasonable notice of the hearing to the prosecutor or require him to submit his recommendation. Sec. 19. Release on bail. – The accused must be discharged upon approval of the bail by the judge with whom it was filed in accordance with section 17 of this Rule. When bail is filed with a court other than where the case is pending, the judge who accepted the bail shall forward it, together with the order of release and other supporting papers, to the court where the case is pending, which may, for good reason, require a different one to be filed. Sec. 20. Increase or reduction of bail. – After the accused is admitted to bail, the court may, upon good cause, either increase or reduce its amount. When increased, the accused may be committed to custody if he does not give bail in the increased amount within a reasonable period. An accused held to answer a criminal charge, who is released without bail upon filing of the complaint or information, may, at any subsequent stage of the proceedings and whenever a strong showing of guilt appears to the court, be required to give bail in the amount fixed, or in lieu thereof, committed to custody. Failing in these two requisites, a judgment shall be rendered against the bondsmen, jointly and severally, for the amount of the bail. The court shall not reduce or otherwise mitigate the liability of the bondsmen, unless the accused has been surrendered or is acquitted. Sec. 22. Cancellation of bail. – Upon application of the bondsmen, with due notice to the prosecutor, the bail may be cancelled upon surrender of the accused or proof of his death. The bail shall be deemed automatically cancelled upon acquittal of the accused, dismissal of the case, or execution of the judgment of conviction. In all instances, the cancellation shall be without prejudice to any liability on the bail. Sec. 23. Arrest of accused out on bail. – For the purpose of surrendering the accused, the bondsmen may arrest him or, upon written authority endorsed on a certified copy of the undertaking, cause him to be arrested by a police officer or any other person of suitable age and discretion. An accused released on bail may be re-arrested without the necessity of a warrant if he attempts to depart from the Philippines without permission of the court where the case is pending. Sec. 24. No bail after final judgment; exception. – No bail shall be allowed after a judgment of conviction has become final. If before such finality, the accused applies for probation, he may be allowed temporary liberty under his bail. When no bail was filed or the accused is incapable of filing one, the court may allow his release on recognizance to the custody of a responsible member of the community. In no case shall bail be allowed after the accused has commenced to serve sentence. Sec. 25. Court supervision of detainees. – The court shall exercise supervision over all persons in custody for the purpose of eliminating unnecessary detention. The executive judges of the Regional Trial Courts shall conduct monthly personal inspections of provincial, city, and municipal jails and the prisoners within their respective jurisdictions. They shall ascertain the number of detainees, inquire on their proper accommodation and health and examine the condition of the jail facilities. They shall order the segregation of sexes and of minors from adults, ensure the observance of the right of detainees to confer privately with counsel, and strive to eliminate conditions inimical to the detainees. 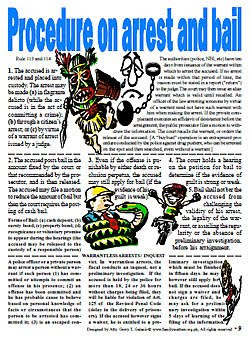 In cities and municipalities to be specified by the Supreme Court, the municipal trial judges or municipal circuit trial judges shall conduct monthly personal inspections of the municipal jails in their respective municipalities and submit a report to the executive judge of the Regional Trial Court having jurisdiction therein. A monthly report of such visitation shall be submitted by the executive judges to the Court Administrator which shall state the total number of detainees, the names of those held for more than thirty (30) days, the duration of detention, the crime charged, the status of the case, the cause for detention, and other pertinent information. Sec. 26. Bail not a bar to objections on illegal arrest, lack of or irregular preliminary investigation. – An application for or admission to bail shall not bar the accused from challenging the validity of his arrest or the legality of the warrant issued therefore, or from assailing the regularity or questioning the absence of a preliminary investigation of the charge against him, provided that he raises them before entering his plea. The court shall resolve the matter as early as practicable but not later than the start of the trial of the case.